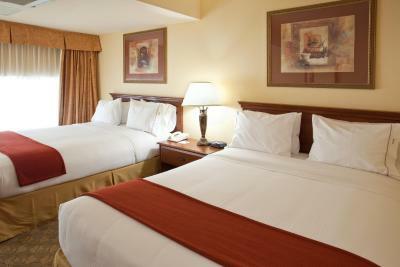 Lock in a great price for Holiday Inn Express Hotel & Suites Austin SW - Sunset Valley – rated 8.4 by recent guests! Comfortable. Able to adjust room temperature easily. Good location near freeway ample of parking and comfortable size rooms. Room on top floor was available like I had requested and it was very quiet which is what we needed. The front desk was incredibly friendly and went out of their way to accommodate. The only positives of our stay included a: strong air conditioner, decent bed, hot shower, and nice breakfast. Considering that this is an older hotel, the room was clean. Helpful, friendly staff--pointed me to terrific locally owned, Italian restaurant for dinner delivery. The room was very spacious and the hotel is clean. Holiday Inn Express Hotel & Suites Austin SW - Sunset Valley This rating is a reflection of how the property compares to the industry standard when it comes to price, facilities and services available. It's based on a self-evaluation by the property. Use this rating to help choose your stay! One of our top picks in Austin.A 10-minute drive from downtown Austin, Texas and 11 miles from Austin-Bergstrom International Airport, this hotel features an outdoor pool, gym, and warmly colored rooms with a 32-inch flat-screen TV. 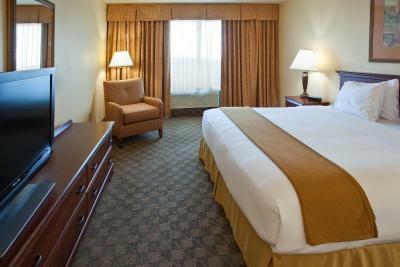 Each room at Holiday Inn Express Hotel & Suites Austin SW Sunset Valley includes gold accents and blackout curtains. A hardwood desk is provided along with cable TV and free Wi-Fi. The 24-hour business center is located off of the lobby and a continental breakfast with eggs, bacon, and cinnamon rolls is served in the morning. The front desk is open 24 hours a day. The Austin Convention Center is a 10-minute drive from Sunset Valley Austin Holiday Inn. The Barton Creek Mall is 3 miles from the property. 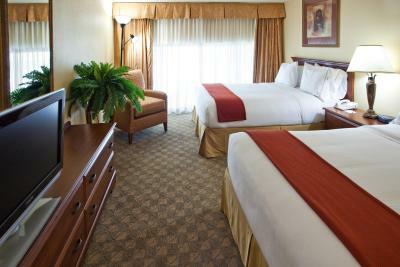 When would you like to stay at Holiday Inn Express Hotel & Suites Austin SW - Sunset Valley? This double room offers 2 large double beds or 1 extra large double bed. This room features a microwave, refrigerator, and sofa bed. This room includes a microwave and refrigerator. 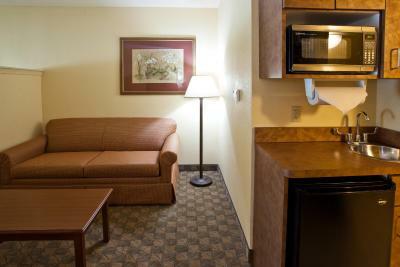 This suite features a kitchenette and sofa bed. 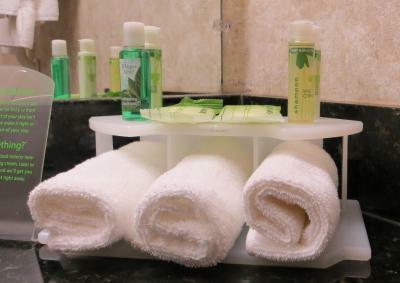 House Rules Holiday Inn Express Hotel & Suites Austin SW - Sunset Valley takes special requests – add in the next step! Holiday Inn Express Hotel &amp; Suites Austin SW - Sunset Valley accepts these cards and reserves the right to temporarily hold an amount prior to arrival. Holiday Inn Express Hotel & Suites Austin SW - Sunset Valley accepts these cards and reserves the right to temporarily hold an amount prior to arrival. Omelet over cooked. No waffles! Very comfortable bed! Convenient to out training. The traffic near the entrance/exit coming around the loop. Otherwise, I love this place. This place is clean, the staff is friendly and helpful. The room smells great and everything functions like it should. Breakfast area is a bit too small. Room doors slam close so hard and so loud that could wake every body up. Manager was rude. Didn't do much but stand around telling other employees how to make customers lives increasingly difficult. Front desk college clerk was nice, but also way more involved in her personal life than professionalism in front of hotel guests. A bit far from downtown - $25 , and about $35 from airport with yellow cabs. Nothing to do with the hotel, just for information purposes! Amber at reception was a gem - so helpful! Given my food limitations, I asked about breakfast options and was told there was "bacon and sausage". I couldn't have the sausage, but intended to have the bacon. 3 out of 4 days, there were 2 kinds of sausage and no bacon. That could have been more clear. The staff was unattentive and unaccomodating, which was especially upsetting as I was in town with a friend for a special occasion - the baby shower of my first grandchild. I had reserved two Queen beds, but was given only a King. In response, the rude clerk said, "Since you booked through a third party, we can give you either one." He offered nothing other than moving to another room the next day which included only a couch that makes into a bed. No thanks, especially for the high rates we were paying at this facility! In addition, the room was dirty, refrigerator and coffee maker didn't work, and the bathroom was dirty, moldy, and in need of repairs. When all was brought to the attention of this hotel, the only compensation offered were some meager points. The pool area needed a bit of attention - some ripped cushions. The staff was super helpful and friendly, the breakfast was plentiful and delicious (those warm Cinnabons!!! 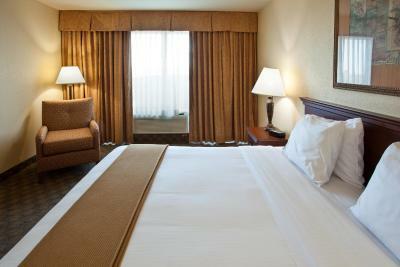 ), the room was spacious, well-equipped and very comfortable and quiet. That I had to spend the rest of my trip alone because someone has commitment issues.